This isn’t a typical Persian dish, so forgive me if the name doesn’t quite work in Farsi. 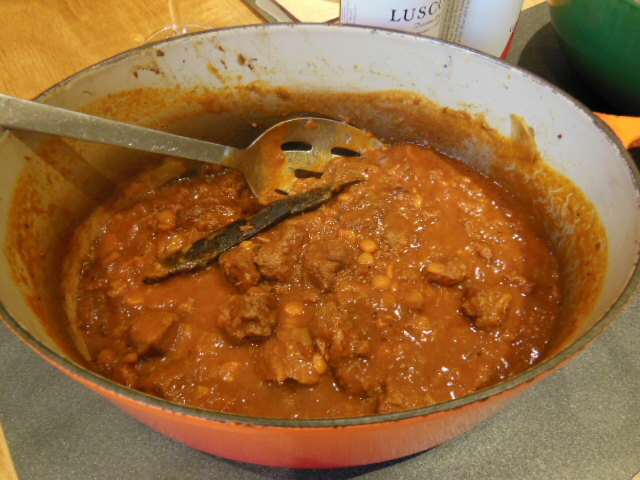 But it is our adaption of a lamb and barberry khoresh (stew). It came about when we discovered a long forgotten piece of venison at the back of the freezer. After all this time it deserved a slow cook to tenderise the meat, so we scoured our cookbooks, and then during a shopping trip in Leytonstone we found barberries, safflower and dried rose petals and so this dish was created. If you can’t find barberries, you could use dried cranberries. Heat the oil in a large heavy-based pan, add the sliced onions and garlic and gently fry for 5 minutes until they begin to soften. Add the cubed venison meat, and brown for a few more minutes. Next add the lentils, turmeric, barberries, safflower and tomato puree and stir well to combine all the ingredients. Add enough water to cover, pop in the cinnamon stick and season with salt and pepper. Cover and simmer on a low heat for about 2 hours until the meat is soft and melting. Add hot water whenever it is needed. Just before serving, stir in the rose water. 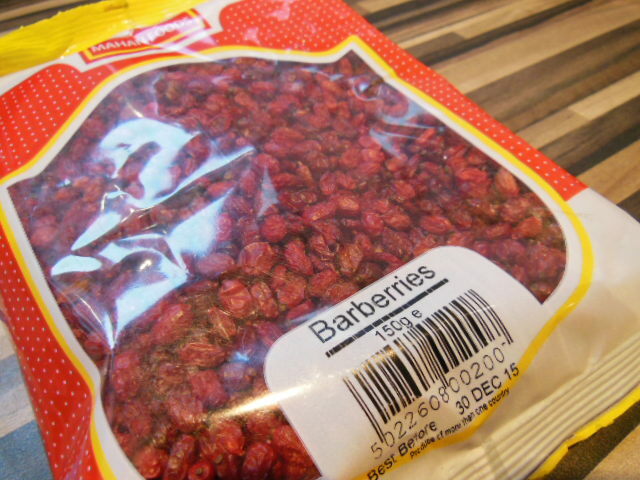 Put the dried barberries in a bowl and cover with hot water and leave to soak. Wash the rice a couple of times to remove the excess starch. Melt 1 tablespoon of the butter in a large pan, add the washed rice and fry for a few minutes to coat the grains. Next add the water and bring to the boil. Cover the pan and simmer for 10 minutes. Meanwhile, in a dry frying pan toast the almonds and pistachios for 3 or 4 minutes then remove the nuts onto a plate. Add the rest of the butter to the frying pan and turn up the heat. Add the sliced onions and fry until brown, stirring frequently to avoid them burning. Drain the barberries, add to the onions and continue to fry for a couple of minutes. 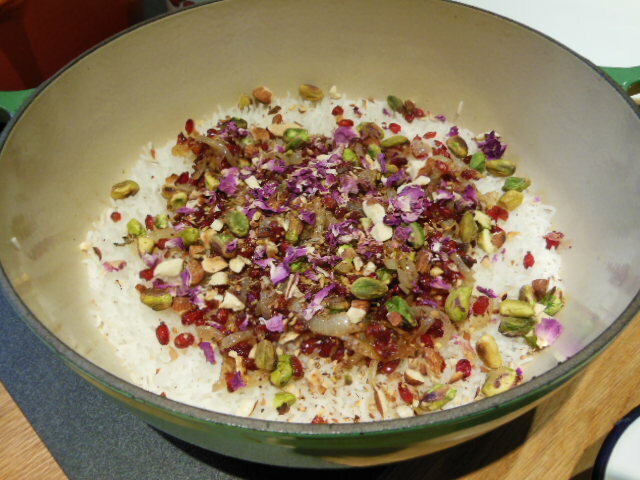 When the rice is cooked and fluffy top with the fried onions, barberries, almonds and pistachios, and finally sprinkle with rose petals. Shopping tips: we bought the barberries, rose petals and safflower from TFC Turkish supermarket in Leytonstone, near the overground station. 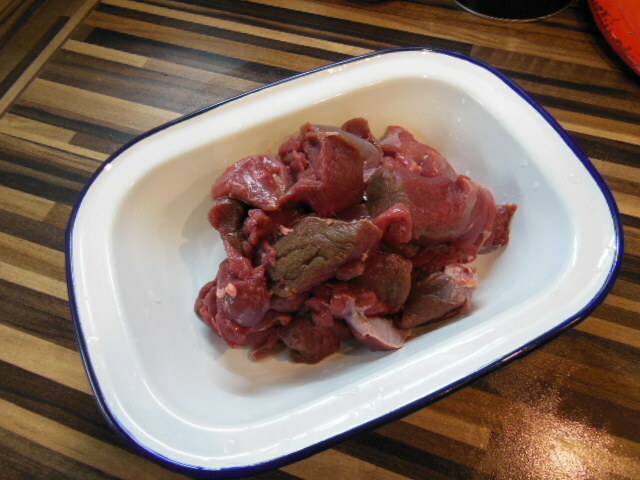 Venison can be bought in season from the Radwinter Wild Game stall on Walthamstow Sunday Farmer’s Market. 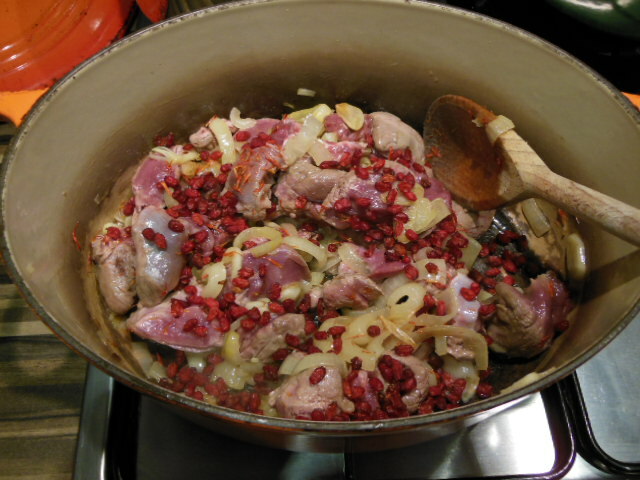 This entry was posted in Recipes and tagged Barberries, Game, Jewelled rice, Khoresh, Lamb, Leytonstone, london farmers market, Persian, Rice, Rose petals, Safflower, Stew, Venison, Walthamstow Farmers Market. Bookmark the permalink. Mmmhhh. That looks like a beautiful flower arrangement. But tastier! lol! -not usually into pretty food but this does taste great – promise. Thinking about doing this for a supperclub in the New Year.